Sail Cowabunga! : A Family's 10 Years at Sea (Paperback) | Copperfield’s Books Inc.
From Bordeaux, France to San Francisco, California, this book follows a Franco-American couple and their two young sons across the Atlantic Ocean and into a ten-year journey at sea. Through their adventures and misadventures, tragedies, and glories across four continents, the Couvreux family rarely had a dull moment living on the water. Janis chronicles in vivid and lively detail how they fended off a midnight intruder, sailed to the microscopic St. Peter and St. Paul rocks on the equator, explored the jungles of French Guiana and Devil’s Island, and sailed through Cuba in the turmoil of the late 80s. Their adventure was not without hardship, however, as Janis recounts battling medical emergencies that required sending her husband across the globe for treatment (twice), leaving her to single-handedly orchestrate a Panama Canal passage amid pre-war chaos. 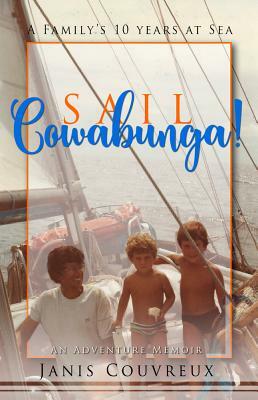 While living in the close quarters of their 42-foot sailboat, the Cowabunga, the Couvreux family was able to maintain sanity and a normal daily routine of cooking, schooling, and sleeping at sea, knowing all the while that something unexpected might be waiting just around the next peninsula. Janis Couvreux is a blogger for Huffington Post, The Lady Alliance, and Pryme Magazine. Her vignettes have been recently published in Foliate Oak Literary Magazine, Longreads, and Luna Luna Magazine. She is the recipient of the Adult Nonfiction award from the 2017 San Francisco Writers Conference. She lives in Petaluma, California.